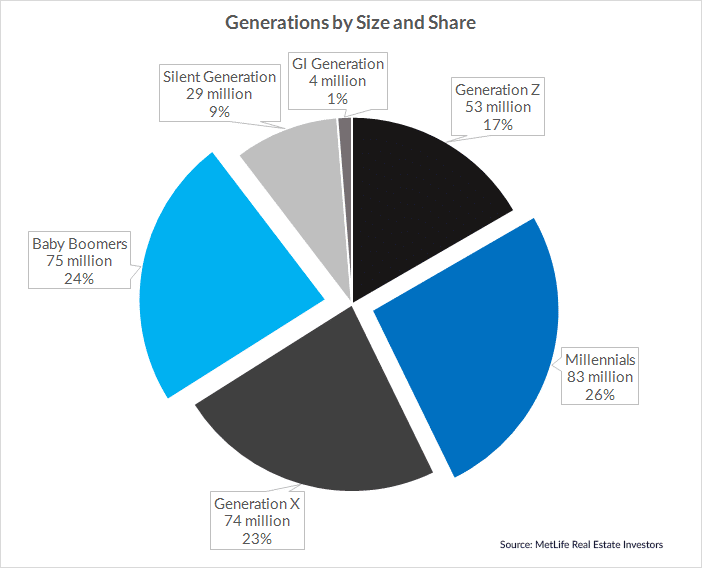 As Millennials grow older and become a larger part of the United States economy, it will become more important for retail tenants to cater to their increased preference for experiences over “stuff” when compared to prior generations, according to a report released by MetLife Real Estate Investors. Melissa Reagen and Adam Ruggiero, authors of the study, uncover a dramatic shift in spending allocation by Millennials away from the traditional “Stuff” category including items such as furniture, electronics and apparel. Instead, this emerging generation has an increasing appetite for “Experiences” such as travel, dining, movie attendance, sporting events, concerts, etc. According to the study, this trend is not one that will end anytime soon. Retail tenants and investors in the properties they occupy are cautioned to examine the spending trends of both new and aging generations. The average age of first marriage has increased by 2.5 years over the past twenty years, which means Millennials are getting married later in life and therefore taking longer to enjoy the efficiency benefits of cohabitation. They are also saddled with stagnant wage growth in the 25-34 age group and a substantial student loan burden (currently an average of $35,000). Going forward, it’s reasonable to expect more Millennials to get married, gain experience in the workforce (to offset the low wage growth) and pay down their student loans. This will free up additional cash flow, potentially to the tune of $41 billion annually. While Millennials are driving the demand for experience-based retail at the lower-end of the age spectrum, Baby Boomers are doing the same thing at the upper-end. As they enter their “golden years” they will likely continue to shift their spending towards dining, entertainment and travel. No longer furnishing large homes or raising children, Baby Boomers will likely reduce their spending on material goods as they move towards a more efficient lifestyle. Millennials aren’t the only generation who are shifting their focus to experiences over material goods. Baby Boomers are doing the same. The study authors calculated a ratio of spending in the 25-34 age group between Stuff (furniture, electronics, apparel) and Experiences (travel, dining, movie attendance, sporting events, concerts, other). They call this the experience-to-stuff ratio and the changes in this ratio in the studied demographic over time supports their theory. In 1989, when Baby Boomers were the only contingent in the age group, the ratio was 1.00, meaning they spent the same amount on Stuff as they did on Experiences. In 2007, where the entire age group was Generation X, the ratio rose slightly to 1.01. However, by 2014, where Millennials made up a majority of the age group for only the 3rd year in a row, the ratio had risen to 1.14, a 12.9% increase in only seven years. As Millennials become a larger portion of the 25-34 Age Group, the entire segment shows increased preference for experiences over material goods. The report clearly outlines the criteria which define optimum retail tenants who are ideally suited to prosper in this new retail environment. There are three primary categories of criteria: Experience, Financial and Distribution. Retail real estate investors should consider Experience, Financial and Distribution criteria when evaluating retail tenants and tenant mix. Financial factors that signal a strong retail tenant include delivering above average sales per square foot, demonstrating free cash flow growth, and maintaining a strong credit profile. These are basic financial metrics all investors should examine and strive to attract the tenants who consistently outperform their competitors. Crucial to investors is the ability to properly underwrite tenant financial performance and stress test individual assets and portfolios. Credit is also an important factor, especially as it pertains to liquidity. Those tenants who have made the effort to maintain strong credit ratings are also those who are able to demand the best corporate bond pricing and entice lenders to provide large credit lines with the most attractive terms. Having greater access to capital allows these tenants to better withstand market shocks and also innovate and pivot their business models if competitors ultimately unseat them. Retailers with locations should realize that the value of their locations is not only in counting store sales per square foot but also thinking of these retail locations in terms of storage and shipping capacity. When stores can double as key links in a much larger distribution chain, they can allow retail tenants to maximize the value of these locations and also increase their stance against purely online competitors. Investing substantially in high-quality websites that enhance the in-store experience and drive traffic to physical locations also create competitive moats that e-commerce retailers find difficult to cross. The most well-positioned property types to take advantage of this heavy focus on driving experiences are high-quality malls and lifestyle centers which are uniquely suited to offer a wide variety of entertainment options for shoppers, as well as high-end unique products with high-touch in-store experiences. For all the reasons mentioned above, these real estate assets are also most likely to attract the premier retail tenants who have the scale to leverage their locations as distribution networks, have demonstrated outstanding financial performance and credit management, and have embraced Experience-Based positioning in their brand message. This mix of goods and services is almost impossible to equal purely online and because these retail tenants tend to have substantial online presence already, they can deliver in an omni-channel fashion. 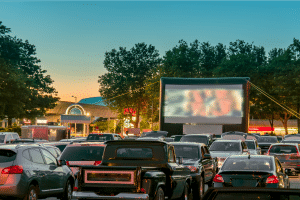 Ensuring a tenant mix which includes bars, restaurants, movie theaters, on-site events, and concert venues is already a strategy that is bearing fruit. Data from the National Council of Real Estate Investment Fiduciaries (NCREIF) has shown that malls and lifestyle centers have outperformed other retail formats in five of the last seven years. Further, malls and lifestyle centers delivered annual income growth a full 150 basis points higher than non-mall retail over the same period with excess total returns of 290 basis points. 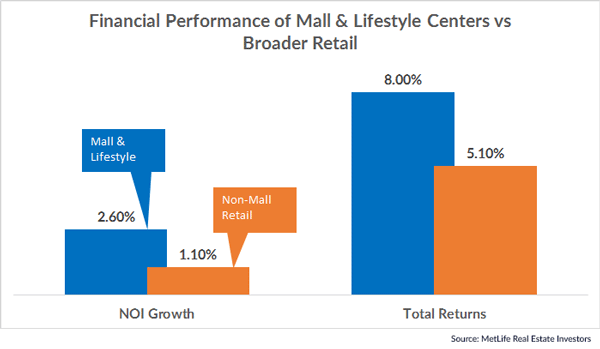 Malls & Lifestyle Centers are outperforming other retail formats on both NOI Growth and Total Returns. Real estate investors should strongly consider high-quality malls and lifestyle centers with an experience-based retail tenant mix that maximizes engagement with target demographics as a long-term strategy that will drive superior performance for their portfolios.